Cardiopulmonary resuscitation (CPR) was first introduced in 1946. Since then, countless human lives have been saved. Did you know that you can perform CPR on a dog? 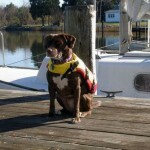 Knowing what to do if your dog is found without a heartbeat or is unable to breathe can save your pet’s life. If you find that your dog is unresponsive, first assess his or her condition using the steps below. In the meantime, have a friend or family member call your veterinarian. The vet can provide support while you administer CPR on a dog, as well as prepare for your arrival at the clinic. The first assessment you should make is to check whether your dog is breathing. Look to see whether your pet’s chest is moving up and down. An alternative method is to feel for air being passed through the nose or mouth. If your dog is not breathing, check your pet’s airway for an obstruction, such as food, vomit, debris, or mucous. Is your dog’s heart beating? If your dog is not breathing, check to see whether he or she has a pulse. Lay your dog on his or her side and move its front leg away from the body. Place your fingers in the “armpit” area, where you should be able to detect a pulse. 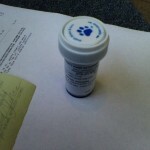 A second location to check is on the dog’s “wrist,” which is above the uppermost pad on your pet’s paw. If your dog is not breathing, but has a heartbeat, begin artificial respiration for your dog immediately. First, position your dog such that his or her head is in line with its body. 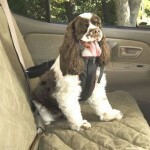 Ensure that your dog’s airways are not restricted. Unlike human artificial respiration, which is mouth to mouth, you will place your mouth over your dog’s nose. For a large dog, you must hold the animal’s mouth closed. For a smaller dog, you should place your mouth over your dog’s entire snout. Next, breathe into your dog’s nose and watch for his or her chest to rise. For proper artificial respiration, you should breathe into your dog’s nose ever 2 – 3 seconds, for a total of 20 – 30 breaths per minute. Be careful not to breathe too hard, which could damage your dog’s lungs. 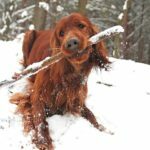 Reassess your dog’s condition once per minute. 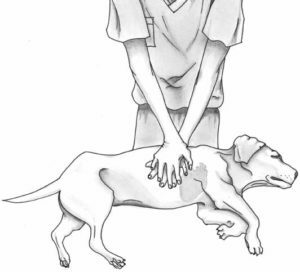 If your dog does not have a heartbeat, chest compressions should be started before artificial respiration. Place the dog on his or her side and find the location of the heart (beneath the armpit). Set your palms on your dog’s chest and firmly press down, then release, in rapid succession. This compress-and-release cycle should be repeated 10 – 12 times every 5 seconds. After each 5 second segment, give your dog an artificial breath. Reassess your dog’s condition every two minutes by checking for a heartbeat. Chest compression and artificial breathing can be continued for up to 10 minutes before determining your dog unresponsive. When your dog’s heartbeat and breathing return to normal, you should take your pet to the veterinarian immediately. Ultimately, performing CPR on a dog is not a difficult task, so long as you know what you are doing!